The number cited is counted from October 18, 1587 when a landing party that included Filipinos from the Spanish galleon Nuestra Senora de Buena Esperanza touched ground in Morro Bay near San Francisco. In 1595 Filipino sailors were aboard the San Agustin when it was shipwrecked near Point Reyes in San Francisco Bay. In 1793 an article in the national magazine, Harper’s Weekly, detailed the story of the “Manila Men” and their 50-year-old village named St. Malo on the outskirts of New Orleans, Louisiana. In 1788, 1789 and 1848 Filipinos were recorded aboard ships of British, American and Spanish registries that landed in Alaska. That pretty much say about our early ancestors establishing roots in this country. Today, the estimated 3.4 million Filipino-Americans constitute the second-largest Asian ancestry group after Chinese Americans. The quote at the start of this article is from Cora Aragon Soriano, president of the Los Angeles Filipino Association of City Employees (LAFACE). She invites everyone to the 2012 Fil-Am History Awards to be held October 12 at City Hall. Earlier that day the City Council will proclaim October as Philippine History Month. Also at City Hall is an ongoing exhibit of contemporary art by Filipino artists called UGAT: Filipino American Roots. In the city of Carson, home to a large number of Filipinos about 14 miles south of Los Angeles, a month-long series of activities are also scheduled. In fact “Pagbabahagi, Pagbayanihan, Pagbubuklod” (Sharing, Community Spirit, Unity) kicked off last Saturday, September 29, the same day that the statue of Jose Rizal was unveiled at the Carson International Sculpture Garden. At 1:11 that afternoon, native-attired participants of the program Our Cultures, Our Traditions snaked through the mall of Pavillion South Bay to the pleasant amazement of shoppers and shop owners alike. 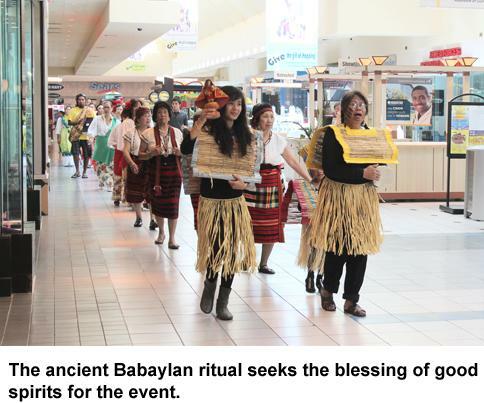 Initiated by the Filipino American Chamber of Commerce – South Bay Los Angeles Area (FACC-SLAA), the program featured a Babaylan rite in which a priestess sought the blessing of good spirits for the event. It was followed by colorful folk dance presentations from different regions of the Philippines. Robert Shroder, director of the Filipino American Symphony Orchestra, did a medley of beloved Filipino songs with a clarinet. Lady troubadour Malou Toler and Mon Concepcion were also crowd favorites with their respective song numbers. 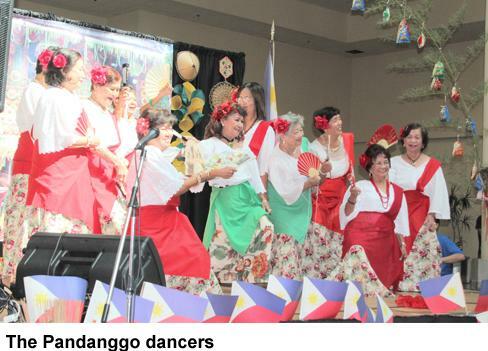 The Sampaguita Youth Dance of Long Beach presented the Palayok Dance and the Golden Girls of Gardena likewise elicited nostalgia with their dances. There was a Pandangguhan, Igorot dance, a Kulintang Ensemble and Fe Koons’ Ati-Atihan group did the “Hala Bira” in honor of the Santo Nino. Carson City Mayor Jim Dear and Councilman Elito Santarina and Consul General Mary Jo Bernardo Aragon provided the usual goodwill talks to the audience. Event emcees were Gelo Francisco, Yong Chaves and John Mina. The next events in Carson will be the Medical Health, Sports and Wellness Day on October 6; Business, Professionals and Career Expo on October 13; Community Pillars & Role Models Day on October 19; and on October 27, a staging of the Filipino Americans Got Talent competition.